Sumptuous action drama from Vietnam which aims to recapture the romance, political intrigue and wire stunts from Hero, only with the occasional detour into CGI nuttiness. Huynh Dong plays the affable backwater orphan boy Nguyen Vu, who is raised in the ways of combat and spirituality by a reclusive monk in a serene temple idyll. Nguyen reaches such extreme levels of enlightenment that he becomes almost supernatural, moving opponents and objects with the power of his mind. The fantasy element stops here – probably in a bid to save on the CGI budget – only to return quite incongruously towards the end of the film. The story instead follows a more rigid wuxia tradition in which the boy enters the city to investigate the circumstances surrounding the death of his family, who were implicated in the sudden demise of the King and executed as political conspirators. He falls for Hoa Xuan (Midu), a sassy lantern seller and part-time ninja lady who also wants revenge on the government for the death of her family. The two develop a touching romance as they survey scenes of state-sanctioned genocide and plot their mutual retribution under beautiful waterfall locations. But fractures soon appear in their plan for revenge; much like the conflicted relationship at the heart of Hero, and it ultimately lands on Nguyen’s conscious as to whether he should act for the will of the people or his own personal vendetta. Clearly the story is nothing new, but the film does conjure up some vivid imagery, notably in its sweeping Vietnamese vistas, lavish sets and costumes, and nightmarish moments of grisly horror. There is also a brilliant kung fu cipher in the form of Khuong Ngoc’s bug-eyed Imperial adversary who wears a cloak and fights with blades up his sleeves. There are also a few lighter moments, which adds to the general pudding of emotions on display. 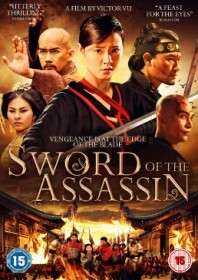 This was Vietnam’s first period kung fu blockbuster, not to mention the country’s most expensive film, and for the most part it’s a fun and easy ride. Sword of the Assassin is available to stream via Koch Media. Order now on iTunes.